The 2012 Major League Baseball First-Year player draft got underway today, and the Seattle Mariners were afforded the luxury of the 3rd overall pick as a result of their poor finish last season. 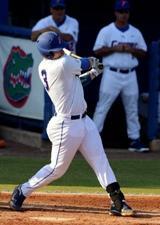 With that pick, the Mariners chose catcher Mike Zunino, a junior from the University of Florida. The 21 year old was ranked as the top catcher in the draft, and has been touted as a strong, athletic catcher with excellent power as a hitter. In 62 games with Florida this season, Zunino had a batting average of .312, hitting 18 home runs and 60 runs batted in.